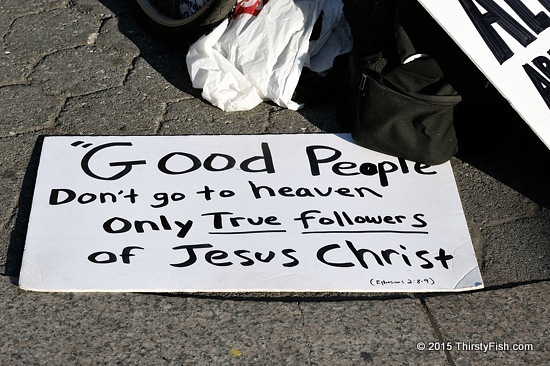 Good People Don't Go To Heaven? Photographed a few days ago in Union Square, NYC. It must be burdensome to walk amongst good people thinking that they are all hell-bound unless they subscribe to the same beliefs as you? Why carry such a burden? Even among the "followers of Jesus", some Evangelists believe Catholics are hell-bound, and vice versa. The misquoted verses, Ephesians 2:8-9 read: "For by grace you have been saved through faith; and that not of yourselves, it is the gift of God; not as a result of works, so that no one may boast". It does not say "good people don't go to heaven". It says, those who have faith in God are saved through God's grace. And, are we supposed to ignore James 2:24: "You see that a person is justified by works and not by faith alone". The problem with Biblical literalists is that they are not. They can't be. Take for example Leviticus 19:17: "You shall not hate your brother in your heart..." and Luke 14:26: "If anyone comes to me and does not hate his own father and mother and wife and children and brothers and sisters, yes, and even his own life, he cannot be my disciple". To hate, or not to hate?